4-DVD set includes Chains: B&W, 94 min., 1949; Tormento: B&W, 98 min., 1950; Nobody’s Children: B&W, 96 min., 1952; The White Angel: B&W, 100 min., 1955. Eclipse Series 27, a Criterion Collection release, distributed by Image Entertainment, www.Image-Entertainment.com. After her family abandons her and her husband lands in prison, a desperate Anna (Yvonne Sanson) seeks work but is repeatedly rebuffed. In Raffaello Matarazzo’s Tormento(1950), highly edited dissolves communicate the futility of Anna’s search without providing its particulars. How different from another fruitless quest, filmed famously in Rome two years earlier: Vittorio De Sica’s Bicycle Thieves (1948), whose protagonist Antonio Ricci (Lamberto Maggiorani) scours the Eternal City for a lost bike as a relentless neorealist lens charts every inch of his pursuit, in all its tedium and lyricism. The dates in the recent Criterion DVD release of Matarazzo’s “Runaway Melodramas” cannot help but recall the neorealism that remains both a glorious foundation myth and unattainable model of artistic excellence and sociopolitical engagement for Italian cinema. Matarazzo’s Chains, Tormento, Nobody’s Children, and The White Angel appeared between 1949 and 1955, a period when masterpieces including Luchino Visconti’s La Terra Trema (1948), Roberto Rossellini’s Stromboli (1950), and Vittorio De Sica’s Umberto D. (1952) made their debuts. These neorealist classics employed documentary-style techniques—often by using nonprofessional actors, unobtrusive editing, dialect-based dialog, and real-time takes under natural light—to depict a rebuilding Italy after twenty years of fascism and several more of world and civil war. The prestige of neorealism—which began accidentally with Rossellini’s stunning Rome, Open City (1945), a film made on a shoestring budget and with no sense it was founding a movement—continues to cloud our understanding of the overall state of Italian postwar cinema; classic neorealist works represent only a small percentage of the films made in Italy in the late 1940s and early 1950s. Yet many filmmakers then and since have labored in the movement’s shadows, and few have felt the sting of the inevitable comparisons to neorealism as sharply as Matarazzo. Criterion is to be applauded for resuscitating Matarazzo as part of the Eclipse Series’ goal of presenting “lost, forgotten, or overshadowed classics,” though that last word can hardly be used to describe the films. Adored by audiences but panned by critics for his neorealismo d’appendice (would-be neorealism), Matarazzo generated enormous box-office sales: 600 million lire for Chains and one billion for Nobody’s Children. The word most often associated with Matarazzo, melodramma, has a particular resonance in the Italian context, since a founding moment in the history of opera was the combination of music (from the Greek melos) and theater (dramma) in Renaissance Italy. Gian Piero Brunetta notes in The History of Italian Cinema: A Guide to Italian Film from Its Origins to the Twenty-First Century (2003) that the melodramatic element in Matarazzo’s films draws on the genre of film-opera in the late 1940s and early 1950s. Matarazzo himself made the biopic Giuseppe Verdi in 1953, and all of the films in the Criterion edition exude operatic elements. No less a filmmaker than Visconti would follow suit in incorporating opera in his evolving vision of the realist film, especially in Senso (1954), which begins with a scene from Verdi’s Il Trovatore. Notwithstanding their obvious differences, Matarazzo and Visconti shared more than a passion for melodrama: each employed the editor Mario Serandrei, whose ability to shape highly charged emotional scenes also gave the horror films of Mario Bava in the 1960s their theatrical élan. All four of Matarazzo’s films feature the actors Sanson and Amedeo Nazzari—who plays himself as a disaffected movie star in Federico Fellini’s Nights of Cabiria (1957)—as well as other regulars, which lends a repertory feel to the performances. Even with their extravagant plots, the films tackle legitimate social problems: the difficulties faced by women seeking to enter a sexist and male-dominated workplace and the challenge of single motherhood (Tormento); the crushing role of honor—and its foil, gossip—in southern Italian life (Chains); the pervasive corruption in Italian business (Nobody’s Children); and the difficulties faced in attempting marital separation in a Catholic country that did not legalize divorce until 1974 (The White Angel). For all the potential neorealist resonance of such themes, the films emphasize Matarazzo’s debt to a popular notion of opera as an exaggerated, even entertaining rendition of life’s miseries, whose devastating effects are mitigated by the artificial nature of the representations at hand. For example, in The White Angel, when Guido (Nazzari) learns that his wife and daughter have perished in a boating accident, an operatic mise-en-scène and dialog ensue. Guido breaks down in front of his attorney (Nerio Bernardi), who tells him that his destiny has been a cruel one. Then the lawyer says to a kneeling Guido, “Devi reagire, riprendersi” (“You must react, recover”). Guido responds, in what could be the basis for an aria, “Reagire? Riprendersi? Ma per chi e perché?” (“React? Recover? But for whom and for what?”). Set in Naples, Chains (1949) ends where it begins: in matrimonial and domestic bliss. As with the other films in the Criterion tetralogy, Matarazzo gives complex roles to children, which aligns him with neorealism, but with none of its intensely local, dialect-driven color. He films them in a mix of high and low angles that emphasize, respectively, their vulnerability in a dysfunctional adult world and unlikely resourcefulness. The son Tonino (Gianfranco Magalotti) displays a range of emotions, from despair to anger and finally compassion, after he catches his mother Rosa (Sanson) holding hands with a former paramour Emilio (Aldo Busi) and tries to prevent her from abandoning the family for him. Following a series of stark plot turns—the husband Guglielmo (Nazzari) kills Emilio in a rage and later Rosa perjures herself by saying she had been Emilio’s lover, to transform the murder into a more defensible crime of passion—Matarazzo ties together the loose ends with jarring alacrity: the film concludes with husband, wife, and children in joyful embrace. In the more ambitious Tormento (1950), a Cinderella theme predominates in another exposé by Matarazzo of the restrictive codes of honor and gender in Naples. An early shot, of Carlo (Nazzari) stealing a moment with his girlfriend Anna (Sanson) in a taxi, is filmed in a rocking studio interior and not a busy Neapolitan street. Matarazzo’s artificial cityscape stands a world apart from the essayistic, on-location version of Naples in Rossellini’s Voyage to Italy (1954). In contrast to Matarazzo’s straightforwardly sentimental soundtrack, Rossellini’s film brilliantly incorporates Neapolitan folk music as a running commentary on the dislocations experienced by the stiff, upper-crust British couple, Alexander and Katherine Joyce (George Sanders and Ingrid Bergman), in their dealings with the local culture. The operatic atmosphere of Tormento becomes farcical—in one scene, the evil stepmother’s appearance is announced with an ominous musical motif, and more often than not the film finds the voluptuous Anna in a wide-eyed, teary aspect. But a genuine sense of melodramatic spectacle prevails. In the above scene where Anna brings her child to her stepmother for help, the characters may as well be singing to one another in a theatrical exchange that even includes the stock figure of an eavesdropping servant. The film, like Chains, ends in the tidiest manner imaginable: husband, wife, and child reunited and embracing as the closing credits roll. Nobody’s Children (1952) picks up on many of the elements from the previous two films: once again Nazzari and Sanson assume the lead roles, as the star-crossed Count Guido Canali and commoner Luisa Fanti, whose tribulations lead her to take the vows to become a nun, Sister Addolorata (Sister of Sorrow). The film takes place in the marble quarries of Tuscan Carrara, but the atmosphere remains decidedly southern, as Matarazzo presents a family tale of honor and passion that ends with the tragic death of Guido and Luisa’s love child, Bruno (Enrico Olivieri). Nazzari demonstrates an impressive command throughout the film in roles as diverse as a stately nobleman, an honest businessman, a thwarted lover, and finally a grief-stricken father. The more one-dimensional Sanson is perpetually in tears—understandably so, given the preposterous number of trials and tragedies she faces. A possible source for Sanson’s exaggerated style lies in one of the most important figures of early Italian film: the femme fatale, where actors including Italia Almirante-Manzini, Francesca Bertini, Lyda Borelli, and Pina Menichelli portrayed morbidly sensitive objects of male desire in films that cashed in on their stardom and allure. Nobody’s Children is the first of a two-part installment, the second of which, The White Angel emerges as the most highly wrought—and ambitious—of the four films in the Criterion edition. Even the opening credits are portentous, as they appear, set to dramatic music, on chiaroscuro cobblestone streets. Early in the film, Sister Addolorata visits her son’s grave and has a vision of him in a flashback scene, superimposed over his tomb-side bust. Shortly after, Guido also has a vision of the dying Bruno, superimposed on an image of the quarry where he perished. Such spectral effects and the camera work in general, are somewhat conventional but masterful nonetheless. Moments later, in a scene where Guido’s wife Elena (Enrica Dyrell) accuses him of still loving Luisa/Sister Addolorata, the slow zoom from medium range to close-up gracefully registers the torture of a woman forced to acknowledge her husband’s preference for another. In a typical burst of overacting later in the film, Sanson, as Luisa’s doppelgänger Lina, whom Guido meets by chance on a train, primps in front of a mirror before sauntering out to meet his captivated eyes. En route, she opens up a window to let in a blast of air—a good thing, given the overheated atmosphere of the scene. Unfortunately for Guido, this ersatz Luisa has another man in her life—a professional knife thrower and conman in her theatrical troupe who eggs her on to squeeze Guido for all he is worth. The film makes the mistake of committing itself to this new plotline, which divorces the narrative from Matarazzo’s forte of family drama and spiritual crisis. Eventually, the real and pseudo Luisa meet—with the latter in extremis—thereby bringing this subplot in line with Matarazzo’s usual mix of hearth and religion. 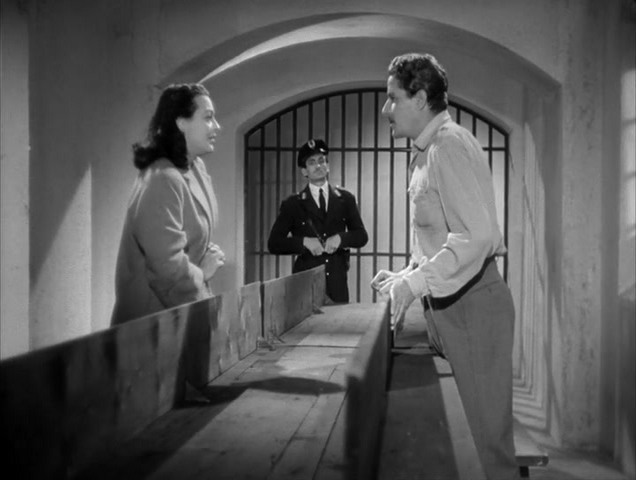 The remaining story contains some of the most successful cinematic moments in the tetralogy: a long corridor shot of Sister Addolarata walking past the prison cells whose inmates announce the birth of Guido and Lina’s son; the ailing Lina’s marriage to Guido in a solemn prison ritual that includes a gorgeous overhead shot of the ceremony. They exchange their vows while a prayerful Luisa kneels in the wings. Preposterous, yes, but also touching. Criterion did well to select four films made in rapid succession, for they beg to be considered as a whole. Matarazzo creates a self-contained world of doomed characters, cruel fate, and untempered passion, all the while crafting rollercoaster plotlines that, after a while, become rather predictable. Matarazzo’s melodramatic world is far from the moral crises and on-location reportage of neorealism. In fact, the four films suggest it would be best to release Matarazzo all together from any association with that magical, contentious term. But his films hold their worth, and not just because of their entertainment value. These popular melodramas give a better sense of the Italian movie public’s tastes in the late 1940s and early 1950s than the works of Rossellini, De Sica, Visconti and their neorealist peers. And the unabashedly operatic nature of Matarazzo’s films reveals an unexpectedly successful vein in the nation’s cinema, as these “runaway melodramas” join ranks with other important genres ranging from early historical blockbusters like Giovanni Pastrone’sCabiria (1914) and the giallo or “horror” films of Bava to the Spaghetti Westerns of Sergio Leone. Freeing Matarazzo from the shadow of neorealism allows one to see his work in all its sparks and blemishes, and provides a misty-eyed glimpse at a rebuilding Italian film industry poised at the vibrant intersection of art and entertainment. Joseph Luzzi is an Associate Professor of Italian and Director of Italian Studies at Bard College. To purchase Raffaello Matarazzo’s Runaway Melodramas, click here.